Andrei Rublev’s painting “Archangel Michael” is in the Tretyakov Gallery, where it occupies high positions. With this work, the artist seemed to combine all possible best qualities of a person and hope. Michael – the first angel at the right hand of God was always personified as the reliable protection of mankind and his interests. It was he who sharpened Lucifer in the netherworld, when he decided to disobey the will of God and kneel before the people. Being a loving brother, Michael fulfilled his task and saved humanity from the murderer. As you know, the work on the icon took place at a difficult time for the artist. It was then that images of harmony and prosperity began to emerge in his mind. 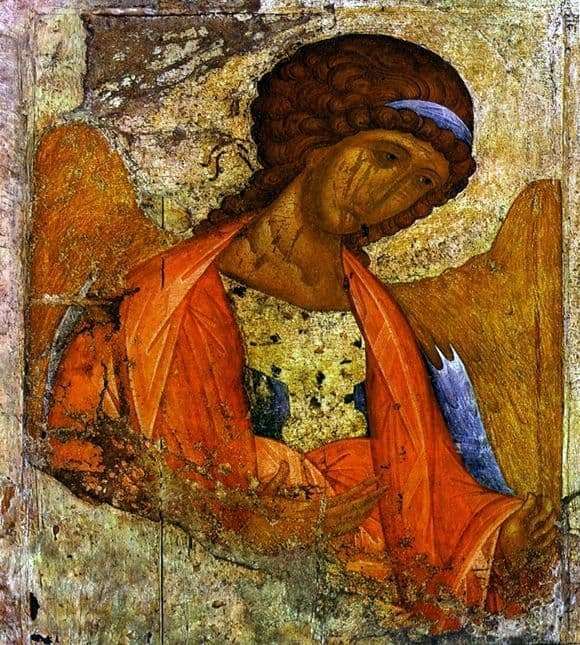 And the best of them Rublev found the image of the archangel. Perfect, unshakable, he seems to rebuff reality and fill the human soul with peace of mind. The image of the archangel is made in accordance with the generally accepted Russian images of the celestials. However, there are also elements peculiar to Hellenic characters – for example, wings. A grimace of reverie, indestructibility and tranquility was immediately added. Thus, the picture became an ideal for all possible heavenly images. The use of pink tones makes it especially attractive. They dominate the face of the archangel. His tender plump lips and cheeks give originality to the image. The warm shade of the picture turned out to be golden-dark curls. After the gentle tones of the face, the bright wings of the archangel are immediately struck – the main emphasis on his heavenly image. Also turned out bright and turquoise bandage on the hair of the character. Then the eye again descends on the soothing delicate color, which is already present on the archangel’s cape. In view of the foregoing, it can be said that the icon turned out to be a kind of comfort for the afflicted.